In this episode #97, I discuss the power of LinkedIn for B2B results. If you tuned into last week’s episode of the podcast, you would have heard me discuss Nametags on Instagram. Well, it seems the rise of the QR continues with Facebook rolling out scannable codes for Pages. Matt Navara spotted it and Tweeted some images. The new codes allow Page managers to create a range of scannable QR images for their Page in various formats. When you are attending large business events do you wonder who’s there and who you’d like to meet? Often event organisers don’t provide a list in advance and any good business owner worth his or her salt will realise it’s the people you meet which can really provide the ROI on attending an event. LinkedIn have just announced a new feature. They are attempting to help us connect with people who are nearby at events. “Find Nearby” uses our device’s Bluetooth to “scan” the people around us. This requires all users to activate the feature to be discoverable. Once activated, we can choose to let people nearby discover us, for the next one to three days – or forever – which in LinkedIn’s terms, means weekdays 9am-5pm. What do you think? Would this compliment your networking plan? Don’t forget to connect with me on LinkedIn to continue this conversation. Google Home or Amazon Echo? Do you have a smart speaker yet? A new study in the US reports that 20% of households with Wi-Fi have a smart speaker. While we don’t have Irish stats to hand, we do know this trend is only going one way because my friends, welcome to the “Age of Assistance” where voice plays a big role. According to comScore, one key reason is lower price points. 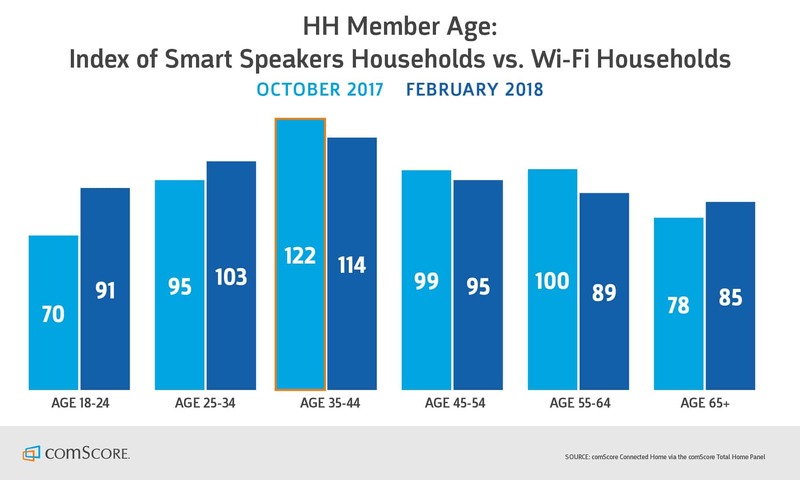 Smart speakers tend to over-index in high-income homes, but lower income households have continued to gain ground. In this episode, I interview Melonie Dodaro, is the founder of Top Dog Social Media and a leading expert on LinkedIn and social selling. She’s the author of two books, including the #1 Amazon bestseller The LinkedIn Code and her brand-new book LinkedIn Unlocked. Melonie has trained over 27,000 businesses and individuals and appears on countless lists as a top sales and marketing influencer. In this interview, we discuss the power of LinkedIn for B2B social selling. In this episode, I share three great LinkedIn hacks. To get more profile views make sure you create your custom clickable LinkedIn profile badge. You can then add it to your website, email signature and blog. I have it on my website footer and all inner pages. To grab the attention of LinkedIn users, why not incorporate some text iconography. I don’t mean doing emoji overload, but just something that grabs attention. A warning however, sometimes the Unicode doesn’t work on iOS or Android so check your mobile LinkedIn profile when you add the next text. How often have you heard social media teachers like JSB telling you to upload a professional head and shoulder shot with eyes looking down the lens of the camera – as your profile picture on LinkedIn. While this is great advice and you should take it, did you know you could split test two of your favourite professional head shots. Use https://www.photofeeler.com – a free online tool that lets people vote on your headshot. Photofeeler has separate categories for Business, Social and Dating photos and 9 traits you can test for. Is it worthwhile going premium on LinkedIn? I have had a Premium LinkedIn account for about 18 months. With any paid for service, the best advice is try before you buy! You must decide if you are going to actively use the features premium offers. However, the basic service has fantastic benefits to suit all of us. In today’s JSB’s column, I share why LinkedIn has become my business’s best social-selling friend. For me, LinkedIn has proven an invaluable tool for my business. Why, I hear you ask? Well over the past 18 months, here are the results I’ve had. I’ve been actively using LinkedIn Sales Navigator for four months. Allows you to perform multi-faceted searches for prospects (based on company size, industry, location, etc). Notifies you how you’re connected to people at the prospective client company. Shows employment trends at the department level which can be really helpful for targeting accounts. I wish that LinkedIn Sales Navigator had better notifications. It seems like they just don’t function correctly (shows I have a message but I don’t, etc). LinkedIn Sales Navigator is well suited for somebody looking to perform specific searches for prospects. It is also well suited for opening another avenue of communication with prospects through InMail. Finding ways to be introduced can be helpful as well, or where you’re just looking for some common ground to base an introduction off of. Find out more at https://business.linkedin.com/sales-solutions/sales-navigator. If you want help developing your LinkedIn strategy, then get in touch. Simply email joanne@digitaltraining.ie. I want to signal a word of caution about this tool. Its usefulness comes with its ability to reach out and connect with potential prospects more easily. It replaces a very manual process with a more systemised one. Start by inputting the keywords that are relevant to your business into eLink pro, and it will automatically search for the right matches for you. eLink Pro not only filters the profiles of your potential prospects in bulk, it also engages with them on Twitter for you. But beware of over-automation. The research phase is super useful, though!